No sewing projects on the go for today... my work in progress today is my blog. I'm thinking that I need an overhaul... my blog I mean, not me. Though I probably could use a bit of a spruce up. I've noticed lately that my posts are either sewing projects or my snapshot sunday pics. Somewhere along the line I lost the variety. I've been a little uninspired lately and thought maybe tidying things up here would kick start my creativity. So on the to do list... design a new header, maybe add some colour to my layout, post more regularly, come up with some new ideas for posts, maybe start posting some of my other crafty projects... the list goes on. ...in semi related news, today is my one year blogiversary! Hurray! 10 fat quarters in one of my favourite colour combinations, grey and green! EVERYONE HAS 3 CHANCES TO WIN!! 3) Get a friend to follow me, then ... you guessed it, come on back and let me know! Giveaway now over, stay tuned for the winner! International entries are welcome! I will randomly select and post the winner on May 4th, please make sure you email is visible in your profile or displayed in your comment. Congrats on your Blogiversary! I hope your overhaul goes well. I came across your blog from last week's WIP posting on Freshly Pieced and decided to stick around. Oooh, thanks so much for a wonderful giveaway. I love your choice of fabrics! Congrats on the 1 year mark! Mine is coming up soon too! 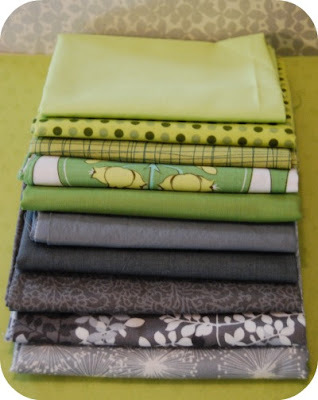 Found you through Freshly Pieced...Great fabric set - love those limey greens!! Love the fabrics! Cool 1yr blogging! i am crushing on green/gray combo too! Aneela hoey's new line has the most marvelous green!! good luck with the blog overhaul! following yoru blog now...thought id stick around and see what an overhaul looks like, i could certainly use one too! Nice blog. Congrats on your anniversay! Congratulations to you! If my blog were a plant, its leaves would be curling up for lack of water this past month :) It's hard to balance blogging and real life -- looks like you are doing just fine, and I look forward to seeing what's next! I am your latest follower and look forward to many more visits! Now I'm your latest follower!! Did I just read correctly that you are interested in a toaster from Canadian Tire?? Does that mean you're a fellow Canuck?? Happy bloggiversary!!!! and thank you for the wonderful giveaway! Happy blogiversary! The fabric is beautiful! I'm a follower of the blog. Thanks for the giveaway! Congrats on the 1st year of your blog! Congratulations! And hooray for the lovely fabrics, thanks for giving away! And to Eryn... yep Canuck through and through!